The formation received its name in the early 20th century when geologists observed a black, organic rich shale in an outcrop close to the Barnett Stream in San Saba County. The geologists decided to name the formation after the stream. The Barnett Stream is named after John W. Barnett, who settled in San Saba County during the late 19th century. The Barnett Shale was first discovered in 1981. Its first well was completed utilizing nitrogen foam fracturing technology. While the first well produced some gas, it did not produce large enough to cause any industry buzz. Despite low production rates, several more wells were installed during the mid-1980’s utilizing various fracturing techniques such as gel fracturing. The gel fracturing technique increased production incrementally and technically was considered a success, but none of those wells resulted in economically viable volumes of production. Successful and economically viable volumes of gas were not extracted from the Barnett Shale until 1997 when the “slickwater” hydraulic fracturing technique was utilized to extract natural gas. This technique allowed for significant reductions in the completion costs of wells and dramatically increased natural gas production rates. After this breakthrough, many companies began acquiring acreage in North Texas. After the introduction of the horizontal drilling technique and increase of natural gas prices in the early 2000s, the Barnett Shale became more economically viable. By 2008, more than 2,900 horizontal drilling wells were drilled in the area. The Barnett Shale spans 5,000 square miles in north central Texas, covering at least 24 counties. The Barnett Shale is believed to be one of the largest onshore natural gas plays in the U.S. The formation has an estimated 40 trillion cubic feet of technically recoverable natural gas reserves, according to the Institute for Energy Research. The Barnett Shale is unique because it marked the first unconventional shale to produce large amounts of natural gas, which showed that shale gas could be produced profitably through hydraulic fracturing and horizontal drilling, according to the Institute of Energy Research. The Barnett Shale has made a major economic impact in the north central Texas region. The geological formation has generated more than 100,000 jobs, which consists of direct jobs in the energy industry and indirect jobs in supporting industries, according to the Dallas Business Journal. The shale has been generating more than $11.1 billion in economic growth annually in the area. It has been responsible for nearly 39 percent of the region’s economic growth since 2001. The Barnett Shale was formed during the Mississippian period around 338 million years ago when Texas was a shallow ocean. The formation is composed of organic-rich shale and limestone. It has three members: a lower shale, a middle limestone and an upper shale. The Barnett Shale’s mineral composition includes quartz, calcite, dolomite and siderite. In 2006, the Newark East Field (Barnett Shale) was the largest gas field in Texas. The Newark East field had more than 2,400 active wells that covered 500 square miles. Currently, more than 6,000 square miles of reservoir has been discovered. The Barnett Shale is 5,000 to 8,000 feet deep. Its thickness ranges from 100 to 500 feet. 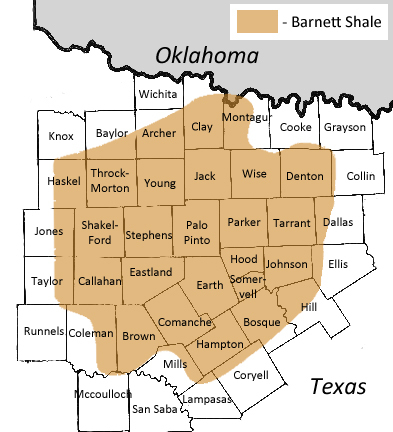 The shale underlies four core counties: Denton, Johnson, Tarrant and Wise. It also underlies the city of Fort Worth and other densely populated areas, which creates additional obstacles to oil and gas mining companies. Despite such obstacles, the shale production is booming. In 1993, the shale produced 30 MMcf of natural gas per day (300 million cubic feet) and in 2013, the production increased to 5,189 MMcf per day. The number of completed wells has grown from 150 in 1993 to 17,332 in 2013. The state has received an estimated $5.8 billion in tax revenue, and independent school districts in the area have received over $45.8 million in tax revenue from this natural gas production.